Alleged Port Arthur gunman Martin Bryant. Photo on the left was used by the media to convince you of Martin Bryant's "guilt". 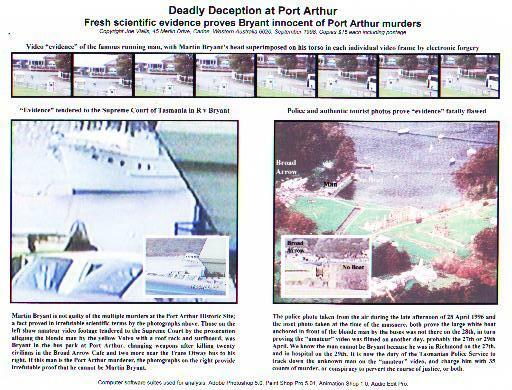 Photo on right taken from a different angle, shows identical three men on balcony of the Broad Arrow Cafe, and the man alleged to be Martin Bryant running down towards the bus park at Port Arthur in the presence of a police helicopter. This frame was shot at 2.45 p.m., one hour and fifteen minutes after the mass murder was over! This damning photographic evidence by itself proves Martin Bryant was deliberately set-up, wrongly accused and wrongly convicted. Remember, a camera cannot lie. For many years specialized computer software has existed which is quite capable of altering electronic image data so accurately, that in the hands of an expert, video footage can be altered so subtly that evidence of the resulting forgery is difficult and sometimes impossible to detect. Fortunately for law enforcement and justice, expert forgers can be careless, as was the case with the forged video footage tendered to the Supreme Court of Tasmania in R v Martin Bryant, some of which is shown on the above collage. 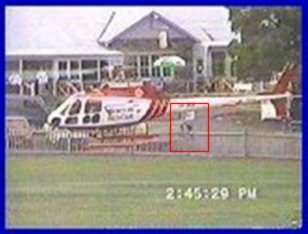 The eight small frames across the top of the collage were claimed by the Tasmanian Director of Public Prosecutions to show "Bryant" running away from the Broad Arrow Cafe immediately after the mass murder. This claim was later reinforced by the former head of the Port Arthur taskforce, Deputy Commissioner Jack Johnson, who was quoted verbatim in the Melbourne Sunday Age on 28th August 1998 stating: "The tourist video showing Bryant fleeing the cafe has been authenticated." Both men were wrong. Under magnification, each frame of the video shows that the face of the running blonde man at all times points towards the camera, with no horizontal, vertical, or twisting motion of the head, and no change in facial expression. All these factors are anatomical and physiological impossibilities for a fast-running human figure, proving that the single "still" photograph of Martin Bryant's head was electronically superimposed on the torso of a different running man, sequentially on each individual video frame. At higher magnification, pixel distortion between the superimposed head and the original torso confirms this analysis scientifically. The author recently secured authentic tourist video footage of this same running man taken from a different angle, which provides a fingerprint-exact match with every item of his clothes, with every step he takes as he runs down the road towards the bus park, and with every aspect of the three men standing on the balcony of the Broad Arrow Cafe behind him. The real owner of the running torso has black hair and has already been identified. With the exact date and time of the authentic tourist video known, this evidence will be reserved for Bryant's appeal before the Supreme Court of Tasmania, or a properly convened Royal Commission, whichever comes first. The large and inset frames on the collage are explained in detail in the text blocks below them, which provide irrefutable scientific proof this man is not Martin Bryant. There are further significant scientific errors which may be of interest to readers. The blonde man standing by the yellow Volvo in the bus park is wearing a dark-blue donkey jacket, in stark contrast with the running man, who is dressed only in a shirt. Other frames of this blonde man by the yellow Volvo prove he is wearing shoes of a completely different colour to those of the man running away from the Broad Arrow Cafe, as shown in the eight small frames on the collage. It is an established fact that immediately after exiting the Broad Arrow Cafe, the shooter fired a minimum of five 5.56-mm NATO rounds directly towards the Trans Otway coach shown in both left frames. Despite the five 166 decibel muzzle blasts, each the awesome audio equivalent of a gas gun used to clear entire airfield perimeters of birds, a large flock of seabirds remained sitting apparently undisturbed on the wheelhouse and foredeck of the large white boat in the background during the period when the shooter transited between the cafe and the Volvo. This is impossible if the footage was filmed at the time of the mass murder on 28 April 1996, because these birds would have taken fright at the first muzzle blast, flying directly away from the camera, which is filming from the general position of the Broad Arrow Cafe i.e. from the same direction the five rounds were fired. As shown on the two frames provided from this sequence, the flock of seabirds are only frightened later by the sound of a single shot fired from the right-hand side of the video camera, and immediately respond by flying off sharply to the left. If backtracked to its only credible source, this single shot must have been fired from the vicinity of the penitentiary ruins: the large building in the centre of the aerial photo shown on the right. At no time on 28 April 1966 did the shooter venture any further south-east than the bus park immediately below the Broad Arrow Cafe, a fact borne out by the forensic evidence, proving this single shot must have been fired by another man on a different day. Though further evidence is not needed, more forgery and thus deliberate deception can be seen on the frames of the blonde man by the Volvo. If you look carefully you will see a thin white "halo" running from the left of the frame across the top of the parked cars, around and above the head of the blonde man, then across the top of the parked cars to the right, before turning upwards and following the exact line of the edge of the triangular camper roof in the upper right foreground. This "halo" contains no pixels at all, proving scientifically that the still foreground including the blonde man and the cars has been "cut and pasted" into the background showing the moving birds, boat, and distant hills. In other words two entirely different videos were merged together to create a special effect. The obvious question is why would the forgers go to all this trouble? At the time of the mass murder the Port Arthur ferry "Bundeena" (shown at top centre of the large frame of the right) was lying alongside the jetty next to the bus park. But at 1530 hrs that afternoon the Bundeena was moved out to her mooring and left there unused for at least a week. So if the forgers filmed their blonde man on (say) 29 April, the Bundeena would have been clearly visible on her mooring in the background, instantly proving that the footage was not filmed at the time of the mass murder. So the forgers filmed the white boat (an Alaskan sport fisherman) at a different location and then "merged" it into their custom still foreground of the unknown blonde man. Unfortunately for them their work was technically incompetent, and forgery can easily be proven in any court of law by state-of-the-art image manipulation computer software of the kind used by the author. As of this date the Tasmanian Attorney General and others have put up spirited resistance to any formal inquiry into this fresh scientific evidence, but it is unlikely they will be able to maintain this undignified posture for very much longer. When fresh scientific evidence is submitted there is a legal requirement that it be properly investigated. "Experts have deluded themselves into believing that science has grown much too complicated to be understood by anyone but a fellow expert. They also believe that progress can only be made by one of their own - a scholar who carries the proper credentials. However, to believe this, they are very ignorant of the history of their own religion. When any group fails to supply its own criticism, there will inevitably be some nasty outsider, like me, willing to do it for them."